General Motors Co. will make 10,000 of its Ampera plug-in hybrid cars available for sale in Europe next year, said GM Europe President Nick Reilly. The Ampera is a sister model to the Chevrolet Volt and is built alongside the Volt in Hamtramck near Detroit. Opel will receive 6,000 of the cars from GM's allotment of 60,000 for 2012. The remaining 4,000 cars will be sold by GM's Vauxhall brand in the UK. The Ampera shares the Volt's technology but has styling changes such as Opel's bold-looking grille. Opel also lists Bose speakers and touchscreen monitors as examples of premium content in the Ampera. GM will launch the Ampera and Volt in Europe in November. GM plans to sell up to 2,000 units of the Volt annually in the region. 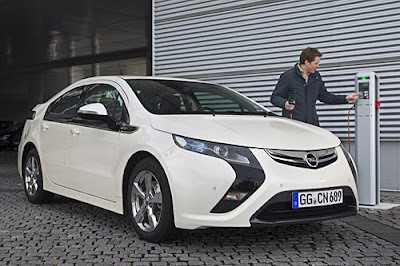 Opel will sell the Ampera for 42,900 euros when it goes on sale in November in Europe, more than the $39,995 (28,125 euros) price of a Volt in the United States. At the Paris auto show last year, Nick Reilly said the Ampera will be aimed at the business fleet market and local government agencies, areas where Opel is strong. The Volt, he said, would be targeted at retail customers in Europe. GM has already started selling the Volt in the U.S. The Ampera will be powered by electricity at all times. For the first 40km to 80 km (25 to 50 miles), power for the drivetrain comes from electricity stored in the 16-kilowatt hour lithium ion battery pack and the car has zero emissions. For longer trips a gasoline-fueled engine/generator sustains the battery charge and extends the driving range to 500km (300 miles).